Where do Fuzzy Hollands Come From? Years ago, the broken pattern gene was introduced into the Holland Lop gene pool. The gene was successfully introduced, but the fur length was also shortened to flyback as a result. To fix that problem, the wool gene (L l) was introduced into the Holland Lop gene pool. The wool gene lengthened the fur back to the desired rollback texture. There was a side effect, though, of recessive genes pairing up to produce Fuzzy Hollands – Holland Lops with wool instead of rollback fur. Normal fur is “L” while wool is denoted with an “l.” The normal fur and wool genes have a relationship of incomplete dominance. That is, the recessive gene (wool “l”) does not show itself completely when the dominant gene (normal fur “L”) is present, but does have an influence on the fur. A rabbit that is LL has normal fur, and no wool gene. A rabbit with one wool gene (L l) will typically have fur that is slightly lengthened and much thicker and denser. That is not an absolute. I have two does that throw fuzzies that were complete surprises to me. Even now that I know they can do it, I do not see the wool gene influence on their fur. Perhaps without the wool gene, their fur would be on the short side and thin. A Holland Lop with two wool genes (l l) is a fuzzy Holland. It is not an American Fuzzy Lop. Fuzzy Hollands tend to have longer, wispier fur than American Fuzzy Lops. This is not always the case, but rather, is frequently the case. 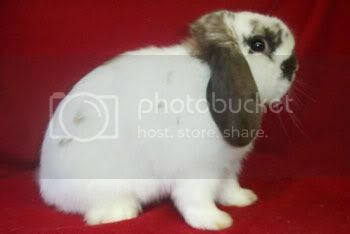 Fuzzy Hollands are shown as American Fuzzy Lops and may do very well on the table, but they should not be registered as American Fuzzy Lops while a Holland Lop is on their pedigree. In contrast, here's a fuzzy lop. Two regular Holland Lops that produce a fuzzy are each fuzzy carriers. You can mark them down as L l. Any time you breed two carriers together, each kit has a 25% change of being a non-fuzzy, non-carrier (LL), 50% chance of being a non-fuzzy carrier (L l), and a 25% chance of being a fuzzy (l l). So, 3/4 of the time, on the average, you will get non-fuzzies. But, I have had a litter of two both be fuzzies. Remember, these are just the odds. Anything can and will happen. A fuzzy carrier bred to a non-carrier (L l x L L) will produce 50% non-fuzzy, non-carriers (L L) and 50% fuzzy gene carriers (L l). Or, to put it another way, 50% normal fur and 50% normal fur influenced by a recessive fuzzy gene. A rabbit that does not carry the fuzzy gene (L L) will never, ever produce a fuzzy offspring, even when bred to a fuzzy. Breeding a fuzzy (l l) to a non-fuzzy, non-carrier (L L) will produce 100% non-fuzzy carriers of the wool gene (L l). So you see that you can use your fuzzies in your breeding program if you want to. I wouldn’t, unless the fuzzy was really outstanding and better than the other options available to me. A fuzzy bred to a fuzzy carrier (l l x L l) will yield 50% fuzzy carriers, and 50% fuzzies. Which kits will turn out to be fuzzies will be totally obvious by age 4 or 5 weeks. You may get a hint at 2 to 3 weeks when you think you have a kit with a remarkably huge head. You will become extremely excited over this kit and then extremely disappointed when you notice his fur is already longer than his dam’s! Some breeders avoid the fuzzy gene like the plague. I do not. I have a few grand champions in my barn that are fuzzy carriers. They are producing outstanding offspring. Yes, I have the occasional fuzzy to pet out (so far 5 out of 400 kits). But I can minimize that by breeding my carriers to non-carriers. I will try to minimize the effects of having the fuzzy gene in my original stock as I go through the generations. But I am happy to be working with such nice rabbits, fuzzy gene or not. 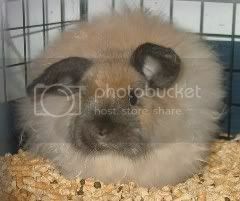 If you sell a rabbit that is a known fuzzy carrier, you should be sure to advise buyers before they decide to purchase. If rabbit’s dam or sire is a carrier, but the rabbit is unknown, you will still want to note the possibility for the new owner.